Innovative wellness approach reaches key milestone. 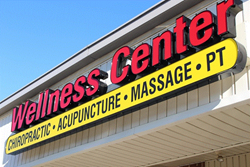 Washington Wellness Center Celebrates 10 Years! By treating patients in a single location, we are able to eliminate much of the frustration that patients have with referrals, multiple office visits, and lack of communication among practitioners. Washington Wellness Center today announced its tenth anniversary of providing a complete approach to health and well-being for central New Jersey residents. What started out as an idea to provide a holistic approach to wellness has now become a growing trend of those seeking an integrated approach to healthcare. Developed by Dr. David Swanekamp, Chiropractic Physician, the wellness center offers a complete range of services such as chiropractic, acupuncture, therapeutic massage, and physical therapy — a combination that is unmatched locally and is in high demand among patients seeking a comprehensive approach to treating pain. Over a decade ago, after successfully providing chiropractic services to a variety of patients, Dr. Swanekamp decided to expand his practice through the development of a wellness center that could treat the whole patient in a single location. The vision was, and continues to be, treating patients effectively through collaboration, transparency, and a deep understanding of patient needs in partnership with other medical practitioners. "The Wellness Center concept was created because of the difficulty patients had with getting access to quality healthcare from a single trusted provider who had an intimate knowledge of their health history and unique situation”, says Dr. David Swanekamp, founder of the Washington Wellness Center. “My goal was to provide a full complement of healthcare services in a collaborative and nurturing environment. Washington Wellness Center continues to grow as patients seek additional local wellness services. Dr. Swanekamp says, “What started as a simple effort to support the growing needs of our customers ten year ago has expanded to become a new treatment option. Washington Wellness Center provides pain management solutions in a single location but goes a step further by offering a fully integrated treatment approach that will continue to evolve over the next decade. It is our promise to continue expanding our treatment options to meet the needs of our central New Jersey patients”.